I was so busy last Sunday washing my hair etc that before I know it it was time to go to baed and I hadn't written to my darling sister. I am so sorry, that I don't know what to do and I hope you won't be disappointed. 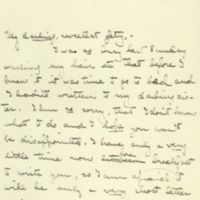 I have only a very little time now betweenfore breakfast to write you, so I am afraid it will be only a very short letter I suppose you have just gotten back from home now. Oh! You lucky thing! How I envy you! You darling! Did you have a glorious time and was everybody well at home, and how long did you stay, and what did you do? Tell me all about it, please. They gave us a very nice Thanksgiving dinner here, and we spent the rest of the day loafing or going to feasts at the girl's rooms. I never ate so much in my life! It was really scandalous. Oh, I forgot. In the afternoon there was a very exciting game of basketball, between the teams of Senior Hall & East Rock (together) and the Main Building. We have to have hall teams because the classes are so small, and Senior Hall is so small that it has to join with East Rock. I play forward in our team, and I am perfectly crazy about it all over again. We beat them ten to three and there was consequently great jubilation. They have never gotten up much interest in athletics until this year but now we are trying to arouse some, and this game started it off.There is really very little to tell you about this week, because the chief excitement and the only interest has been initiation. I wish I could tell you about that!Jetty, darling, Mother told me about what you and Flora had decided to do. Are you really determined? I certainly think it is splendid and brave in you since you really think it is wrong. But is it really so terrible and cruel? I am worried now, because I have just joined one, and of course I can't tell whether it will be the same here. I don't think it could be, because I such a minority of the girls here are in sororities that the others don't feel badly at all and so it is different from most places where they have frats. Darling little, sweetest Detty, I love you so, so, so much, and I hope so that you will still be happy in spite of it. You dear, splendid thing. I must stop now, for it is time for the bell to ring. McAdoo, Eleanor Wilson, 1889-1967, “Eleanor Randolph Wilson McAdoo to Jessie Woodrow Wilson Sayre,” 1906 December 4, WWP17359, Jessie Wilson Sayre Correspondence, Woodrow Wilson Presidential Library & Museum, Staunton, Virginia.